A scene from Yellow Tree Theatre’s play with dance Still Dance the Stars. Photo by Justin Cox. A disintegrating marriage following the loss of a child. That is the central theme of Still Dance the Stars, currently playing at Yellow Tree Theatre in Osseo, MN and bringing the company’s 10th season to its close. Playwright Jayme McGhan wrote the play after he and his wife suffered the loss of a child. Director Jason Peterson, Director/Choreographer Andy Fry, and a talented cast give us a well-done production of a not-so-great play. Louisa Darr in Still Dance the Stars. Photo by Justin Cox. The marriage at issue involves James (Zachary Stofer) and Anne (Vanessa Wasche). After Anne twice refused his marriage proposals, James does a flash mob dance marriage proposal. Naturally, it got caught on video, giving the couple their 15 minutes of Internet fame. Things go so viral that James and Anne were interviewed by television personality Layna (Emily Madigan) when they married. During the following six-year time period, however, the couple had a child who died shortly after birth, saddling them with the double whammy of high medical bills and personal pain. Now, while the couple is planning to separate and divorce, they agree to another interview with Layna for the money to pay the medical bills. Since this is theatre, however, Layna has a secret agenda and is looking for dirt to expose their marriage as flawed. The play centers on the night before the interview, when the couple is going through a box of stuffed toys that come to life as various persons in their life, including a hippo taking on the role of their late child Hope (Louisa Darr). The play itself is a mishmash of ideas that do not come together. The couple spend the night drinking alcohol and getting drunk. Different stuffed animal characters dance on stage and are constantly making entrances and exits, often without a purpose. The only stuffed animal character that stands out is the hippo Hope. Another problem with the source material is the difficulty in identifying with the grieving couple; the script paints James as a real jerk, as demonstrated by his verbal attacks against his sister-in-law Ashley (Mary Fox). Anne is more sympathetic, but the real question is not why they are breaking up but why Anne ever married this jerk in the first place. Added to these are issues going on with the couple’s respective parents. The few times the show really works is when James and Anne talk about their feelings without the stuffed animal interactions, but this scene occurs late in the show and is too short. Most of the dancing does little to advance the show, aside from two notable exceptions. 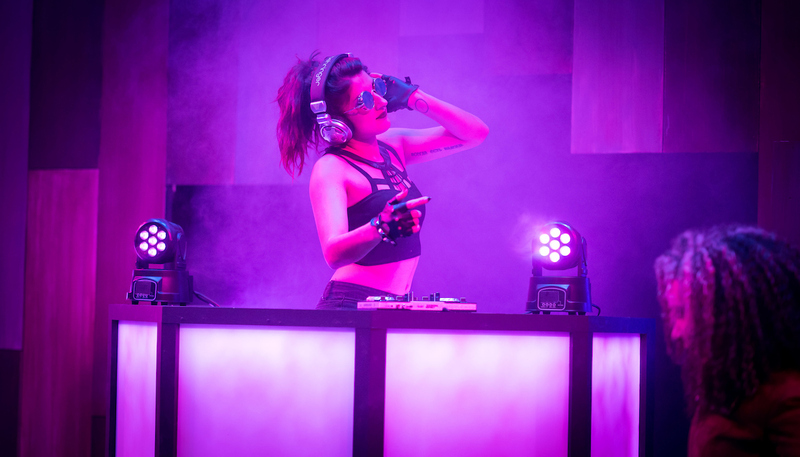 The first is the DJ Spinner (Abby Magalee)’s dancing, whose athletic movement work between James and Anne blends flawlessly with the couple’s interactions. The second occurs when Anne and her daughter Hope dance and come together as one, giving the play its most moving moment. DJ Spinner (Abby Magalee) puts a record on. Photo by Justin Cox. The exceptional acting keeps the audience engaged in this flawed play. Stofer convincingly plays the unlikeable James we meet at the start, but effectively transitions to the more thoughtful, sympathetic husband we eventually see. 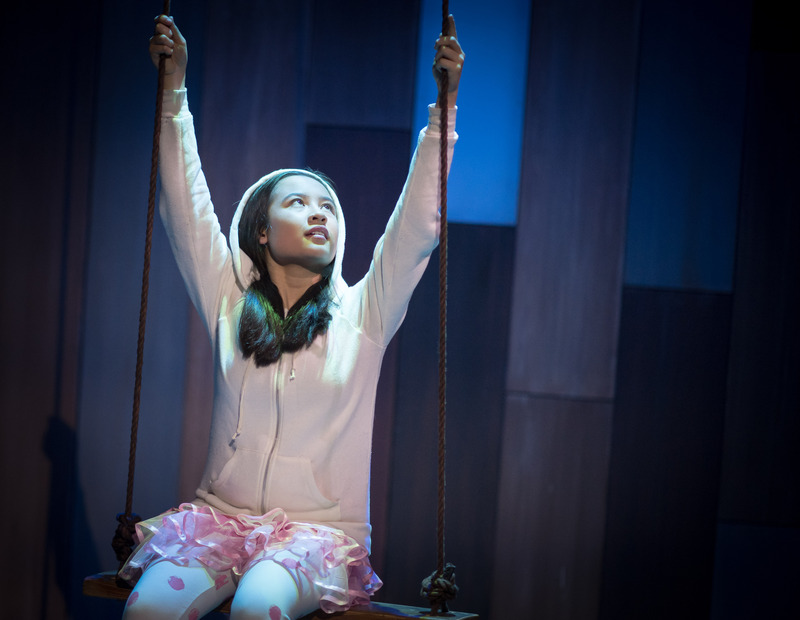 Wasche’s portrayal shows Anne’s ongoing loneliness and pain; the audience cannot help but be happy for her when she is able to meld with her daughter through dance. Darr, as Hope, creates one of the show’s most appealing characters. Fox’s Ashley succeeds in playing a character who is very young and naïve, and yet proves to be one of the wisest in the room. Madigan is thoroughly delicious as the dirt-seeking interviewer and watching her is a guilty pleasure.